Did you know that the state of Washington boasts the longest lava tube in the continental U.S.? The tube is over 2 miles long! 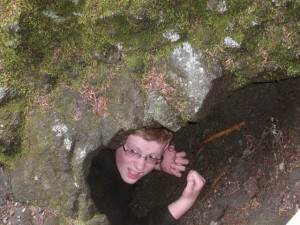 Well the next scout adventure offers you a chance to visit this attraction near Mount St. Helens. We will be heading to the cave on Saturday, May 16th, leaving from the Haggen (old Albertson’s) parking lot at 7am. The 2.5 hour drive will take us to Cougar and then we plan to camp at the Kalama Horse camp where everyone can enjoy their sack lunch. After lunch it is off to explore. There are two sections of the cave. The lower cave is a 0.75 mile easy hike (although it is uneven walking). For those of you willing to try another adventure, the upper cave is a 1.5 mile uphill hike (roughly 2.5 hours to complete). We will be scrambling over boulder piles and scaling an 8-foot high lava fall. Not everyone has to go on this portion of the hike if they do not feel inclined. After we climb out of the cave we will hike back down the hill and have a great dinner back at camp. We plan on returning to Olympia early afternoon on Sunday. Please RSVP if you plan on going on the trip. Hope to see you there!